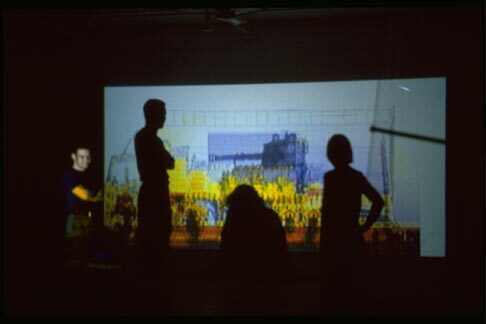 Four Engines is a 20 feet wide x 8’ high video projection. The video shows the metamorphosis of four engines. The vehicles, X-rayed for detection, are: a boat which is subsequently transformed into a tractor before becoming a tank, which, in turn, metamorphozises into a semi-articulated truck. The transformations are slow and gradual. Specific colors are attributed to each vehicle in reference to the history of representation. The vehicles, themselves, have successively been instruments of conquest in Western history. The metamorphosis is accompanied by animal sounds. At first, barely audible, the sound of moaning or grunting becomes more insistent as the transformation progresses. Each vehicle possesses its own modulation. – Produced by Artists Space, New York. •Centre d’Art Contemporain de Pougues-Les-Eaux, France, 2000.